Now Shipping with the NEW Carli Signature Shocks! 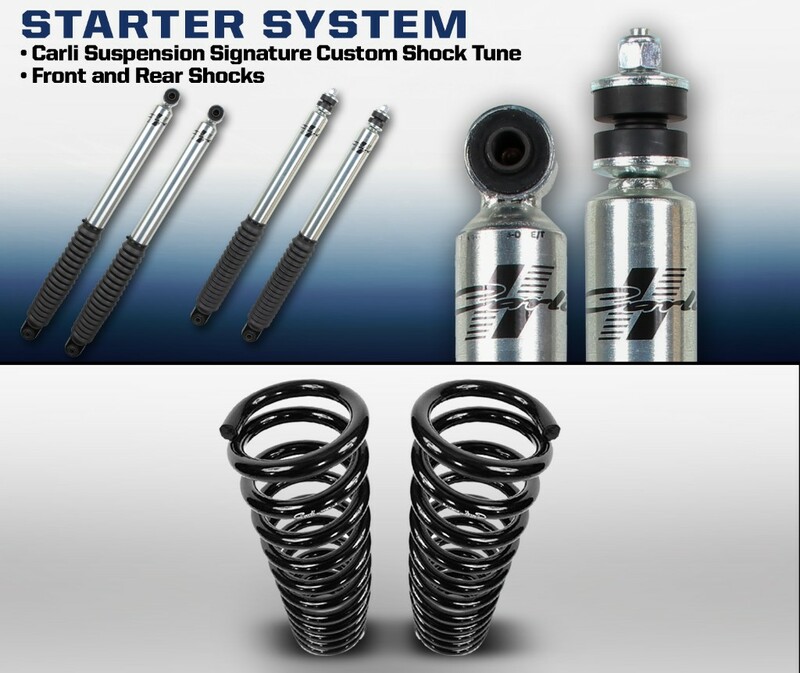 The Starter System includes the Front Leveling Kit and options a rear Add-A-Pack and matching Rear Shocks. 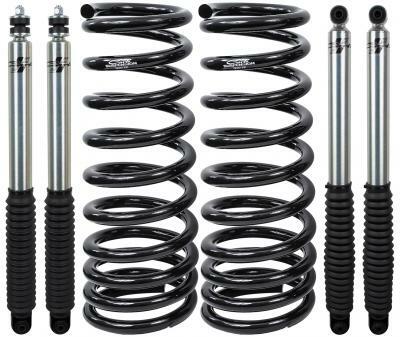 This system is designed for people seeking a leveled vehicle with more performance and ride quality than a generic spacer lift; then, adding the rear kit to further the ride quality improvement. The Carli Signature Series front shocks have been custom tuned, in house, for superior ride quality. Your truck will sit 2.5”-3” higher in the front (year/cab configuration dependent) with 50% more suspension travel than the factory platform thanks to the taller, lighter rate coil springs. The included front & rear Carli Signature Series Shocks are longer to accommodate the extended travel. 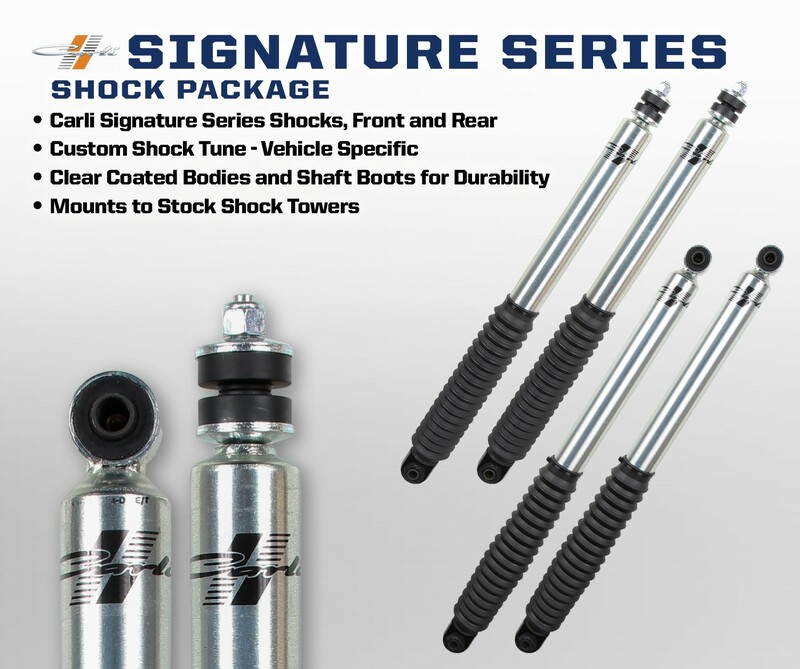 When designing the shocks, Zinc plating, Clear Coat for corrosion resistance and quality bushings were a must; finished off with boots to protect the shafts, we back them with a limited lifetime warranty to ensure their quality is as unbeatable as their ride quality at this price point. When pairing added down-travel with the taller ride height, the position of the factory, front sway bar will need to be altered as well. For this, we offer two options (unless 1994-2002, then there’s only one); extended, Sway Bar End Links or the replacement Torsion Sway Bar. The End links are equipped with ½” FK Rod-Ends and in-house machined 17-4 stainless bodies that are extended over stock to reset the sway bar engagement point. Factory pillow-bushings are re-used to assemble the sway bar to the lengthened link. 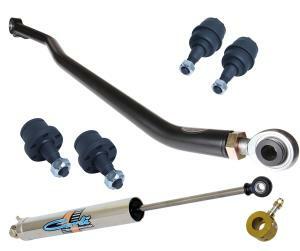 Carli’s Torsion sway bar removes the entire factory sway bar assembly replacing it with a torsion bar supported by fabricated drop brackets and delrin bushings. 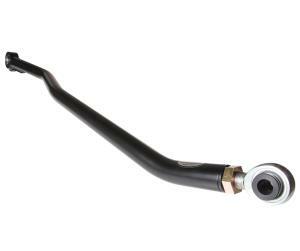 Fabricated sway bar arms and dual 5/8” FK heim end links round off the package. This is the single best bang for the buck, ride-quality upgrade offered by Carli Suspension (in close competition with the full progressive leaf spring upgrade offered in the higher-end systems). When lifting the front end of a straight axle truck, the front axle is pulled off-center unless the proper linkages are addressed. Three inches of front lift equates to an axle shifted toward the driver’s side ¾” and back toward the cab ½”. Although this is perfectly operable, we recommend the purchase of an adjustable track bar to shift the axle back toward the passenger side and provide a stronger link with less deflection for the lifted application, and a set of extended control arms to shift the axle forward to its new center of travel. In the rear, the progressive add-a-pack can be optioned to replace the unyielding factory overload spring to increase comfort, traction & predictability. 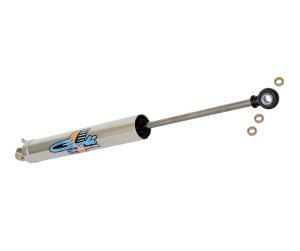 +2010-present vehicles have 2 possible sizes of Sway Bar End Links. Place a socket on the nut that compresses the rubber End Link bushings, an 18mm socket will indicate the need for the 12mm part number. Recommended Configuration - Carli Leveling Systems are Designed and Tested on Vehicles with 17"-18" Wheels with 35", E-Rated Tires. Stock wheels and tires or running a larger wheel diameter will result in a stiffer ride. Torsion Sway Bar - Selection of the Torsion Sway Bar Replacement will not Require size selection as the entire sway bar assembly is replaced. Offset body more than Extended Control Arms for even more tire clearance! Highly recommend this kit...i wasn't sure which kit i wanted to get but i knew i wanted to go with Carli and this is an excellent system for the price. I promise you will not be let down. Definetly get the track bar because with that and this kit your truck will feel like a brand new machine! Purchased this kit mainly for the ride improvement but also for the moderate lift and I haven't been disappointed. Ride is much improved still solid but not jarring like stock. Quality of parts is excellent and install is very doable even with moderate experience tools and help. I installed front one weekend and the rear another. Great package. Ride is great should have came with this from the factory. Price may be higher than comparable kits but once installed it is well worth it. I will be buying more Carli products from 8LUG Truck Gear in the future. It made a HUGE difference. It is much smoother and has much more control off road. I also recommend the track bar to center the axle. Great product! Very quality product also recommend track bar. Love the fact that it pretty much eliminates body roll. I love the ride! This is a great kit. I do recommend the track bar when doing this kit. Its not needed but it will make the truck handle much better!